Boys Playhouse - Who Has The Best Boys Playhouse? A boys playhouse allows the young man in your life to have lots of fun and burn off all that excess energy, and yet at the same time they’re learning valuable social skills that will be very useful in later life, and using their creativity and imagination. If you’re thinking of buying a playhouse but aren’t sure which one is best for your child or grandchild, help is at hand thanks to this WhatShed guide that can help you find your ideal boys playhouse. When looking for the best boys playhouse, we were happy to find fifteen high class examples worthy of a place in our league table. We then ranked them according to their price and value for money, size, visual appeal, durability, and overall fun factor. The majority of playhouses we review are suitable for both boys and girls, and we all know of course that girls will also enjoy playing in a boys playhouse and vice versa. For the purposes of this league table, we were looking for playhouses that had been designed with boys specifically in mind. That means that they are often built to encourage a sense of adventure, and you won’t find rose petals on these playhouses. That ruled many playhouses out, but we were glad to find fifteen very high quality examples for our guide. With such a varied selection of playhouses to choose from, selecting our champion was hard. It’s well done then to the Charlie Tower and slide. It has a lot of play activities to offer, and is great value and very durable, making it our number one boys playhouse that can be bought online in the UK today. From playhouses to summer houses and greenhouses, WhatShed brings you in depth and independent reviews that can help you make an ideal purchasing decision. 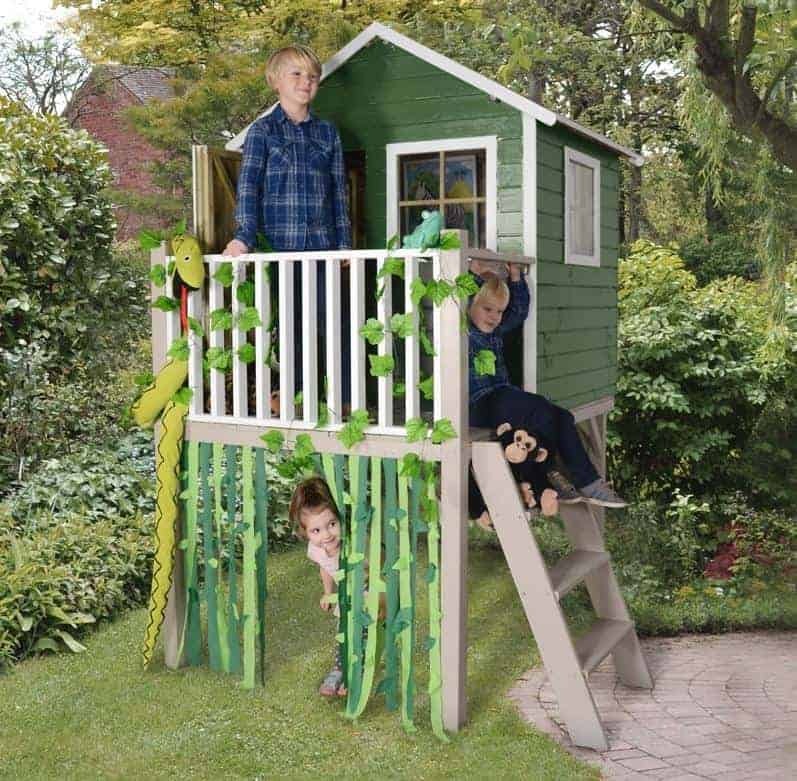 A boys playhouse can come in many forms and sizes, but this Charlie tower has a very practical design in that it offers a large area for your children or grandchildren to play in without taking up too much precious lawn space. That’s because the playhouse itself has a base area of approximately four foot by four foot, and yet is raised high enough above the ground that it allows children to play underneath the playhouse as well, or simply to relax there in its shaded area on a sunny day. This raised level does mean that supervision is necessary of course, but it has been built with safety in mind and carries the EN71 safety mark. 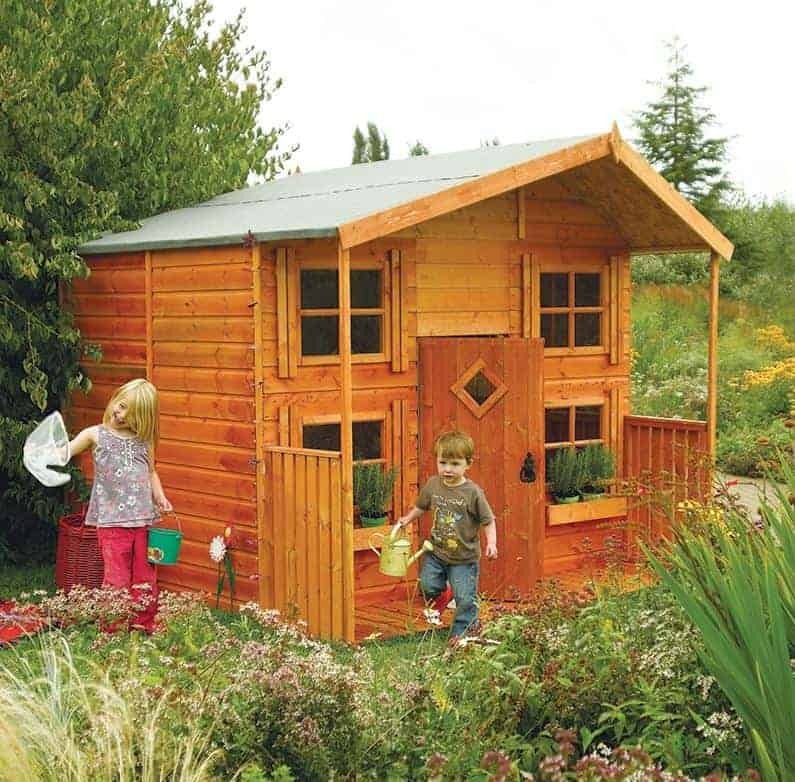 This may lack some of the features found on other playhouses in this guide, for example there’s no slide or swing, but it’s straightforward design encourages boys to use their own imagination when playing in it. We also think it’s rather stylish, thanks to its use of high quality components such as smooth planed tongue and groove cladding. 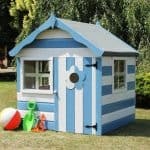 What really makes this boys playhouse stand out from its competitors, however, is its superb value for money. This is boosted by the use of an initial pressure treatment. It’s something we rarely see on a playhouse, and means that it comes with a long 15 year guarantee. This is very reassuring, and helps this playhouse take the top spot in our league table. This is not merely a well designed boys playhouse, it’s a full blown activity centre in it’s own right. That’s because whilst it has an apex roofed playhouse at the heart of it, there’s enough room underneath the playhouse tower to play in or to install a sandpit in, and there’s also a fun wavy slide and an adjacent garden swing. 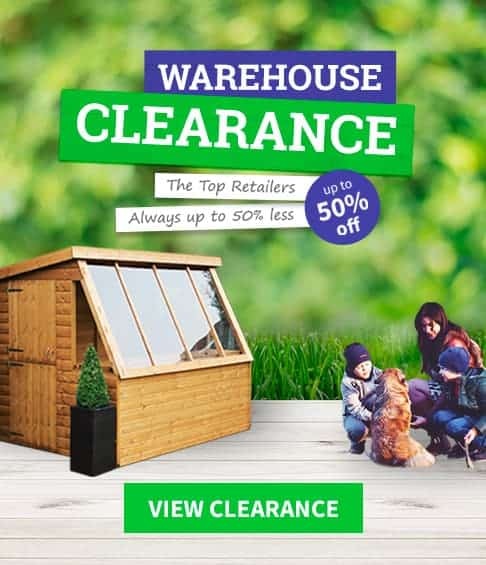 With so much for your children to do and enjoy on this playhouse we feel it offers exceptional value for money at just over six hundred and fifty pounds, and this earns it the runner up position in our league table. The playhouse itself has a base area of approximately five foot by five foot, but the activity centre as a whole takes up an area of around thirteen foot by twelve foot. That’s a good indication of just how much play potential it provides, but it also means of course that you’ll have to have a significant amount of garden space available on which to situate it. We feel that this is an ideal purchase for people who have more than one young child, especially if they’re the energetic type, and for those whose children often invite their friends around to play. The only downside was the lack of an extended guarantee, and it’s this that prevents it taking the number one position. We were pleased, however, to find that it comes with a free tub of base treatment, enabling the owner to make a start on the weather protection. This boys playhouse has a unique look that’s very different to any other wooden playhouse that we’ve reviewed, and it was a style that brought a smile to our face from the moment we saw it. It’s based upon a native American wigwam or teepee, and so will be a big hit with your boys if they like to play with cowboy toys, or if they like watching television shows about the old wild west. In its bare wood state we found it highly attractive, because it has been very well made out of high quality components, but once painted it will really come into its own and should then stand out as an exciting garden feature. 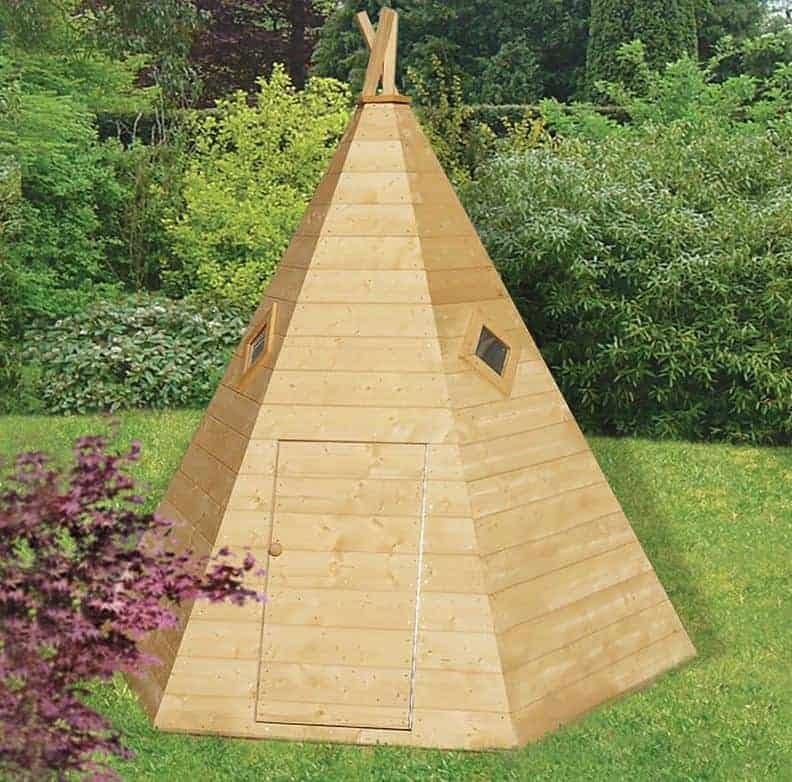 Although this boys playhouse tapers upwards to a point in true wigwam style, there’s likely to be more room inside than you might think. It has a base area of seven foot by six foot, and the peak height is approaching seven foot as well, so there’s more than enough room for two children inside. There’ll also be a plentiful supply of natural light, thanks to the two diamond shaped windows. 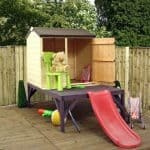 We feel this represents very good value for money for a playhouse that scores very highly on the fun factor, especially as it also comes with a 10 year manufacturer’s guarantee against rot. There are some cartoon characters that appeal to both boys and girls, and perhaps the most timeless one of all is Winnie The Pooh. 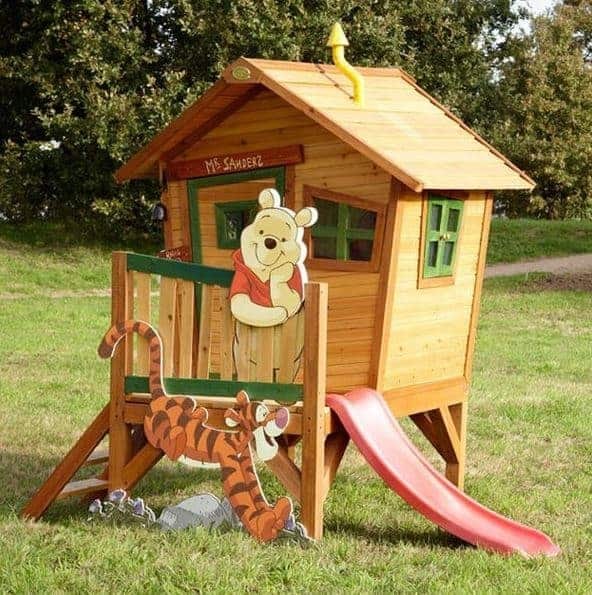 If your son or grandson is one of the many who loves all things Winnie, then this boys playhouse is sure to put a big smile on his face. It uses a tower playhouse design, but it’s not raised too high from the ground so it shouldn’t frighten younger children. They’ll be able to stand on the balcony and look out at the garden below, and standing right alongside them will be Winnie The Pooh himself. There’s also the irrepressible Tigger, always a much loved character, on this playhouse, and we found the wooden cut outs of both these figures to be fun and very well executed. The fun in this boys playhouse doesn’t stop there. We were pleased to see that this Axi playhouse bears many of the hallmarks we’ve come to associate with this manufacturer. It’s funky design says goodbye to straight edges and instead has an angular and chaotic look about it that children will really love. This anarchic look is encapsulated by the yellow chimney pot on the wonky roof, bent in the middle. It’s beautifully put together, and with a 5 year guarantee included as well it’s only the higher than average asking price that stops this gaining a position inside our top three. Sometimes the simplest designed boys playhouse can prove to be one of the best, as it encourages a young child to indulge their own creativity. That’s certainly the case here, as the look out tower design may not have too many frills and flourishes, but it will set young imaginations racing. We can imagine youngsters looking out from the top and pretending that they’re a General sending their troops into battle, or maybe on the deck of a spaceship looking out at an approaching alien horde. Of course, all these scenarios and more can be enhanced with the judicious use of paint. With a four foot by four foot base area, this compact boys playhouse won’t take up too much space in your garden, but once again there’s enough space underneath to use as a hide in which to play games or read comics. What we particularly liked about this model is that it has a ramp leading up to the platform rather than stairs, and with horizontal runners crossing it, its been specially designed to be easy for young children to climb. We also liked the very low asking price of only a little more than two hundred pounds, making this one of the best value boys playhouses that we’ve reviewed. Axi are one of our favourite boys playhouse manufacturer’s, because we know that whenever we review one of their models it will be both original and exciting. We weren’t disappointed with their Arthur playhouse, which delivered on both counts. The Arthur in question seems to be King Arthur, as this look out style playhouse resembles a castle that young minds may easily associate with the knights of the round table. It’s one of the most striking playhouses we’ve seen, and it’s only a 5 rather than 10 year warranty period and a higher than average price point that stops it from being ranked even higher within our league table. The castellated features of this boys playhouse are sure to enthuse an imaginative child, and they’re very well done. At the top are ramparts that lead to a green slide, and there are even two flags fluttering away at the rear above a climbing frame style ladder. We also liked the inclusion of a main doorway that’s large enough for a child to walk through and then a smaller opening that they can crawl through. If your son or grandson dreams of being a knight in armour, then this is the perfect playhouse to fire their imagination and bring a smile to their face at the same time. This boys playhouse isn’t the most innovative that we’ve seen or the most exciting, but it has very traditional looks that will fit in well with a garden that already has lots of stylish timber buildings in it. 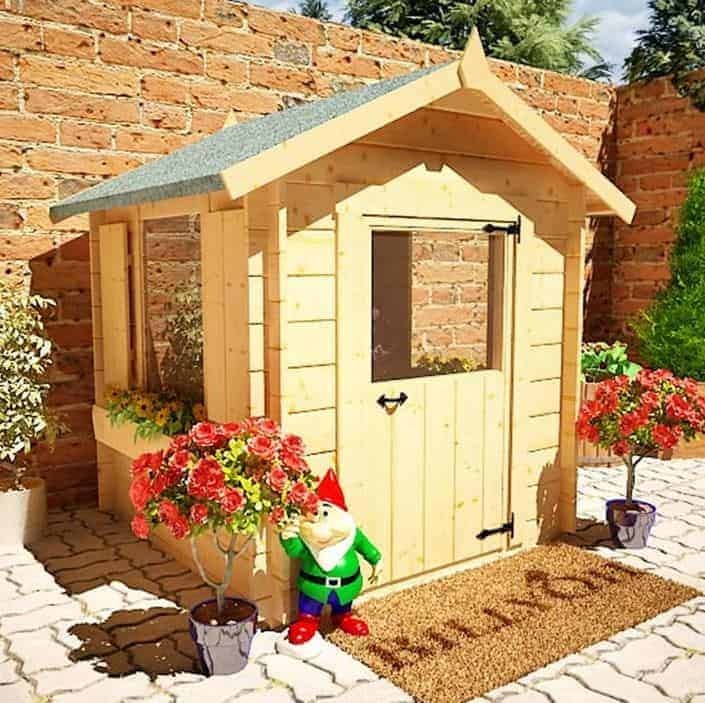 In many ways it looks like a compact version of a classic garden shed, with its felt covered reverse apex roof, and centrally positioned door with an antique brass style handle. This can be transformed however by adding some bright and lively colours, and it allows you to get your children or grandchildren involved in the painting process. 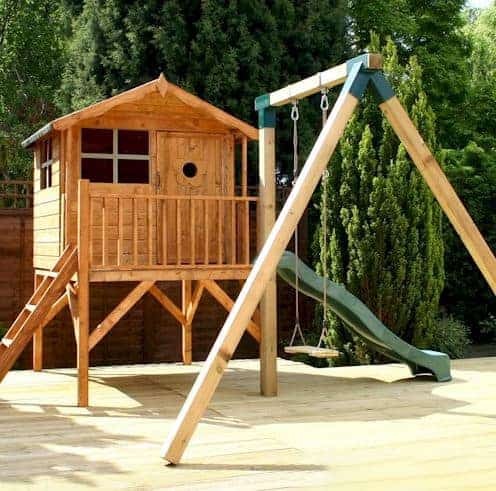 What we liked most about this boys playhouse is that it offers outstanding value for money, with its play area of approximately five foot by four foot being available for less than two hundred pounds. 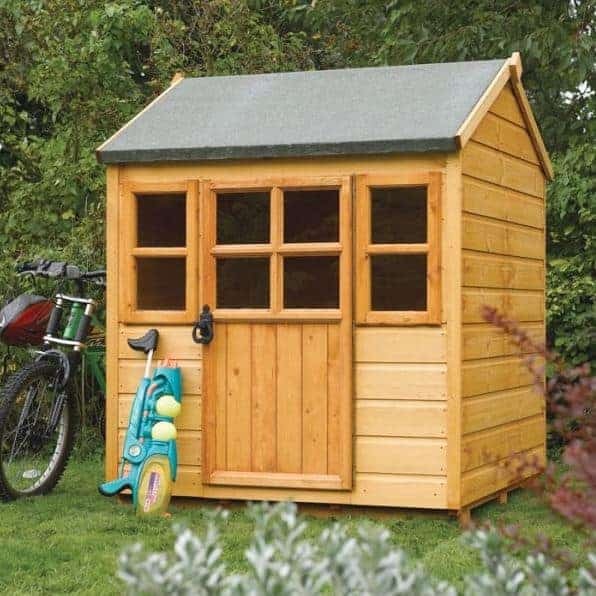 It’s not the smallest playhouse in this list but it’s easily the cheapest, and with the reassurance of a 10 year anti-rot guarantee included as well, that’s enough to earn it a place in the top half of our WhatShed league table. Another advantage it has is that the frontage is dominated by glazing, so there’s lots of natural light inside, which makes it easy to read or play games. Don’t worry, the glazing used is styrene which is a safe and shatter proof material. This boys playhouse had a lot that we liked about it, not least that it’s a great environment for active children to us up their excess energy in a safe and controlled environment. 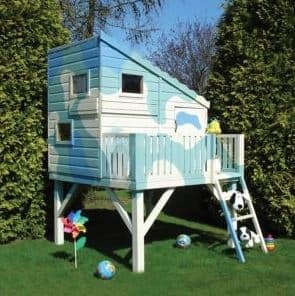 That’s because this is one of the tallest children’s tower playhouses we’ve reviewed, reaching a peak height of 2.92m. With a ladder at one end of the playhouse and a red wavy slide at the other, we can imagine children repeatedly climbing up the ladder and then sliding back down to earth again. It’s lots of fun for little ones, and of course it’s great exercise too. The central boys playhouse area is surrounded by slatted sides, rather than solid boarding, so there’s sure to be lots of fresh air circulating, but the apex roof above it helps to keep it dry during rain. We were very pleased to find that all the timbers had been given an initial pressure treatment, and whilst this brings with it a 10 year guarantee rather than the 15 years we often see in these circumstances we wouldn’t be surprised to find that it lasts even longer. Being made in conjunction with the Woodland Trust also means that the trees charity benefits from each purpose, which is a cause that we’re always happy to support. Only a high asking price prevents this from being placed at or near the top of our league table. If you already have a log cabin on your property, then this boys playhouse will fit right in, and we all know of course how much children like to have things that resemble their parents things. The playhouse has a relatively compact footprint of five foot by five foot, and its design resembles a very traditional garden building. That makes it one of the most elegant and stylish playhouses that we’ve reviewed, although once again a coat or two of vivid paint will make it more appealing to young eyes. The reason that we rate this boys playhouse so highly, and the reason therefore for its place within our top fifteen league table, is that it is very well built and very durable. That’s because the walls are made of interlocking logs with a thickness of 19mm each. This is the thickest cladding we’ve ever seen on a playhouse, and because of this it feels very stable and sturdy once erected. We would have liked to see this toughness and reliability reflected in an extended warranty, and the lack of this accounts for this playhouse’s position in the bottom half of our league table. At significantly less than three hundred pounds, however, we still feel it represents good value for money. As they say, boys will be boys, so if your children or grandchildren love to play at being soldiers then this six foot by four foot boys playhouse will tick all the right boxes for them. It’s designed to resemble a command post from a war film, computer game or action comic strip, and so it may appeal particularly to slightly older children. It’s supplied in a bare wooden form, so we would recommend painting it in camouflage colours to give it added authenticity and an added ‘wow’ factor. The pitched pent style roof of this playhouse, with a fun and pleasing corrugated design, means that there’s a lot more head room at one end of this boys playhouse than the other, but this fits in nicely with the command post design. There are also three styrene windows that children can look out of for approaching enemies; when they come in sight there are two horizontal opening slots, through which can be poked water blasters or nerf guns. Be on guard when you come to call your kids in from their play from this exciting playhouse, you could be in for a soaking. 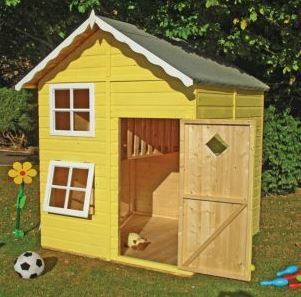 All in all, then, this is a very well priced playhouse, and only the lack of an extended warranty sees it remain outside the top half of our league table. With an eight foot by eight foot base area this is the largest and most imposing boys playhouse in our league table. With this added volume comes added versatility and even more play potential, so it’s ideal for those with a large family. 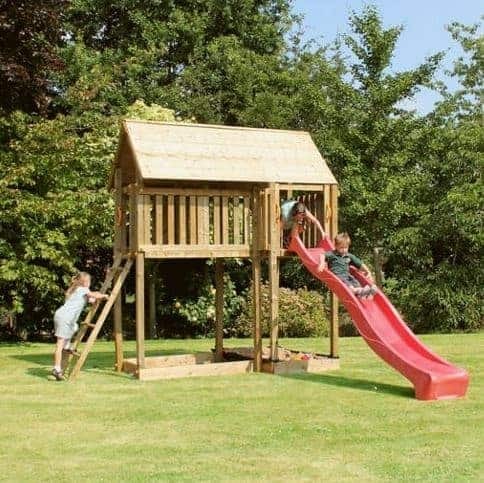 Its straight forward design has a strong look about it, which is why we’ve included it within our list of the very best playhouses designed for boys, but we can imagine it proving just as popular with girls too, and of course being supplied in unpainted wood it can easily be modified accordingly. Because of its size and its highly traditional looks this is a boys playhouse that is sure to be noticed by your neighbours and friends, but we found it rather attractive. We particularly liked the canopy created by the overhanging apex roof and the wooden verandah below it, as this provides a nicely shaded area outside the entrance on a sunny day, and protection from the rain on others. We were also pleased to find a 10 year warranty included as standard, although we would also have liked to see the asking price be a little lower, and this has been taken into consideration when determining its final position within our league table. The great majority of wooden playhouses that we see are supplied in a bare wooden form. This brings some advantages in that they can be painted in the favourite colours of your children or grandchildren, and indeed they can help you select the colour scheme; this can also take up a lot of time, however, as well as extra money. 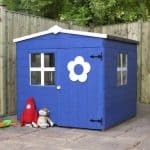 That’s why this boys playhouse will prove to be so popular with those who have a busy lifestyle, as it’s immaculately pre-painted, and we found it to be very pleasing on the eye. 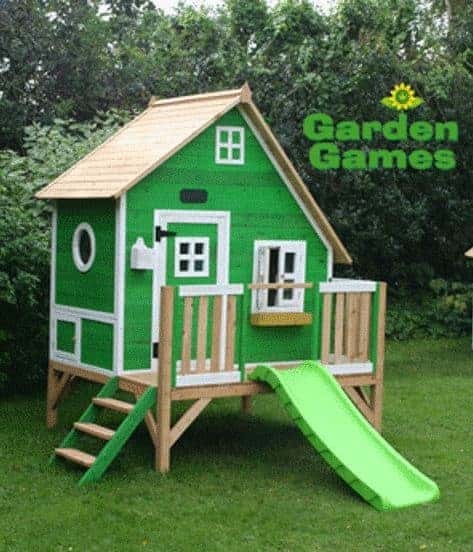 The green paint scheme with white trim on this boys playhouse will fit in nicely with a garden background, and as the main colour is bright and vivid we think it should capture a boy’s imagination. They’ll also appreciate the many fun stylistic touches, including its offset roof, external postbox, and round porthole window. It’s also a great choice for energetic children, thanks to its lime green slide coming down from the platform. 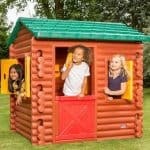 We found a lot to like about this playhouse, although it does come with a larger than usual price tag, even taking into account its generous base area of approximately seven and a half foot by eight foot, especially as it lacks an extended warranty against rot. 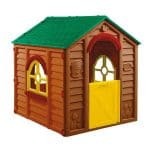 This is the only non tower style boys playhouse that features two floors, and that brings with it obvious advantages. Whilst the base of the playhouse covers a floor area of approximately five foot by five and a half foot, there’s an upper bunk area inside as well, meaning that there’s a lot more space to play in. It could even be used for dual purposes, with one child playing downstairs and one on the upper level reading a book or playing on their favourite video game. One of the things we liked most about this boys playhouse is that it has an offset apex; this still carries out the vital function of carrying rainwater away, but it also makes it more exciting visually, which we feel young boys in particular will appreciate. We were also pleased to see that the lower of the two styrene glazed windows can be opened, which makes the provision of cooling air for ventilation purposes easy on a hot day. 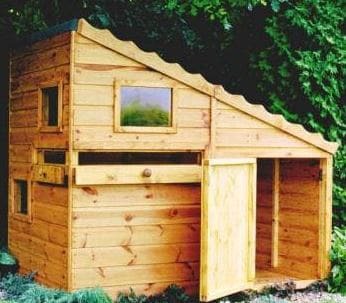 If this had an extended warranty then it would feature much higher up our league table, but even as it is this is highly recommended for those who are in search of a well constructed and good looking two tier playhouse for their boys. This boys playhouse takes the design of the command post that we looked at earlier in this league table and elevates it, in more ways than one, by placing it onto a raised platform. This makes it an even more fun filled garden building for your children and grandchildren to enjoy, and there’s enough room underneath the platform to play in as well, or to relax in after a hard day of commanding the command post with water pistols and toy guns. It also comes at a significantly higher asking price, however, which accounts for the relative positioning of the two command post playhouses. If this falls within your budget, the extra area available means that it may be the one that you should consider first. Once painted this can be one of the most striking playhouses of them all, but we were glad to see that this tower style boys playhouse is tough as well as attractive. Smooth planed shiplap cladding is used throughout, which is why it feels reliably strong once assembled. As the timbers lock tightly together it also effectively keeps rainwater out, so whilst your boys are defending the playhouse against imaginary foes the playhouse itself is providing a sturdy defence against the elements. This is the only boys playhouse to gain a place in our WhatShed league table that isn’t made of wood. Instead, it has fabric walls, but you’ll be pleased to discover that there is a strong metal frame underneath it to give it much needed stability and toughness. Whilst feeling strong, this frame is also lightweight, which should make the playhouse as a whole very quick and easy to assemble. If you need a colourful and imaginative playhouse that will appeal to boys in a hurry, then this could be just what you’re looking for. 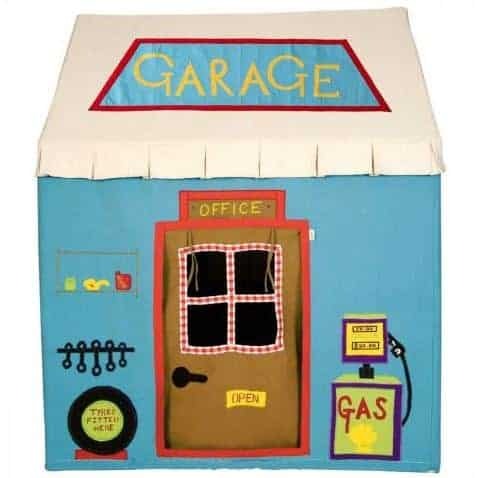 If your child or grandchild loves cars or motorbikes then this boys playhouse could really ignite their imagination. It has a garage design that’s bright and full of colour, and we imagine that young children in particular will find it lots of fun. The pattern features embroidered fuel pumps, tyres, spanners, oil cans and more. For added fun, it’s also possible to add extra options such as a matching quilt and bean bag. 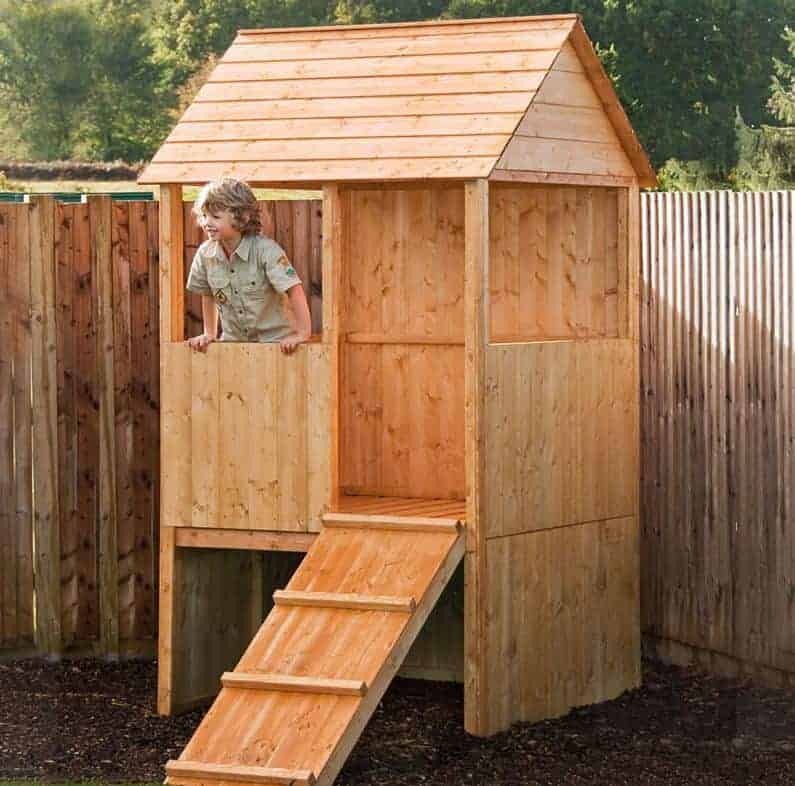 An added bonus is that this is suitable for either indoor or outdoor use, although of course it lacks the durability and sophistication that we find on many of the wooden playhouses that we review, which is why it has to be content with the fifteenth and final position in our handy guide.